You will be contacted by a SpiritPlusNutrition.com sales associate within 24 hours to finalize your order. If ordered on a weekend we will contact you on the next business day. After you place your order SpiritPlusNutrition.com will choose the shipping method that is the best choice for the customer. Serving you is our priority! The prices listed below will not be your final price. We will contact you with the final price of your order once it has been placed. SPN BALANCED Energy Maximizer 2X PLUS AF (2.5#) A texturized, nutritional, medium-starch grain ration containing SPN Custom Slick-Mix 500®, ActiFibe®, & Feed-Fresh™. Feed to Growing & Mature horses of All Breeds, under Various exercise levels, receiving Limited amounts of starch & Various qualities of hay and/or pasture. If feeding a 1,000 lb. horse less than 2.5 pounds per day, supplement with a product containing SPN Custom Slick Mix 500®. SPN LOW STARCH Maximizer PLUS AF (2#) A pelleted/texturized, nutritional Low Starch & Low Sugar supplement, containing SPN Custom Slick-Mix 500®, ActiFibe®, & Feed-Fresh™. Feed to Foals, Growing horses, & Mature Horses of All Breeds, receiving Various qualities of hay and/or pasture, and under Various exercise levels, Feed at 2 lb. per day to a 1,000 lb. horse by itself, or as a supplement to either SPN Premium Grain Blend, or oats. May also be used at a LOWERED feeding rate to supplement other SPN Maximizer Horse Feeds, if extra low starch calories, minerals, vitamins, and digestive therapy, are desired. SPN FREE-CHOICE Maximizer GRASS PLUS A nutritional, free-choice supplement, containing SPN Custom Slick Mix 500® & Feed-Fresh™. Feed free-choice to horses of All Ages & Breeds, under Various exercise levels, receiving hay &/or pasture that is over 50 % Grass. SPN Maximizer ESSENTIALS PLUS (10 oz.) 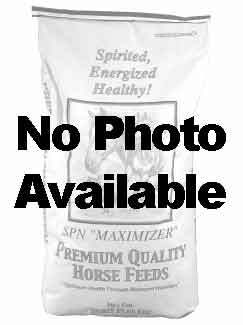 50# A nutritional, granular, supplement containing: Ground Flaxseed, SPN Custom Slick Mix 500®, Feed-Fresh™& ABC N.O.M.S.® Feed to horses of All Ages & Breeds, receiving Various qualities of hay and/or pasture, and under Various exercise levels. SPN DIGESTION Maximizer PLUS Pellet (.5#) A pelleted nutritional supplement containing SPN Custom Slick-Mix 500® & Feed-Fresh™. To be fed to horses of All Ages & Breeds, receiving Various qualities of hay or/and pasture, and under Various exercise levels. Feed at .5 lb. per head to a 1,000 lb. 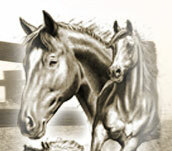 horse, per day, by itself, or as a supplement to either SPN Premium Grain Blend, or whole oats. 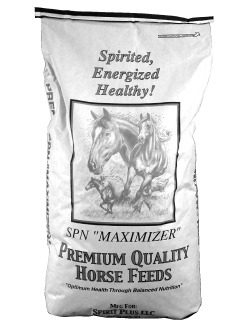 May also be used at a LOWERED feeding rate, to supplement another SPN Maximizer Horse Feed, if extra protein, minerals, vitamins, & digestive therapy are desired. SPN PERFORMANCE Maximizer 14 (5#) A texturized, nutritional grain ration, containing SPN Custom Slick Mix 500® & Feed-Fresh™. Feed to Growing & Mature horses of All Breeds, under Moderate to Heavy exercise, receiving Various qualities of hay and/or pasture. If feeding a 1,000 lb. horse less than 5 pounds per day, supplement with a product containing SPN Custom Slick Mix 500®. SPN Premium Grain Blend A texturized, premium-quality, nutritional grain ration, to be fed with SPN Custom Slick Mix 500®, or an SPN Maximizer supplement that contains SPN Custom Slick Mix 500®. Feed to Growing & Mature horses of All Ages & Breeds, under Various exercise levels, receiving Various qualities of hay and/or pasture. SPN SENIOR Maximizer PLUS AF (5#) A pelleted/texturized, nutritional, LOW-Starch, grain ration, containing SPN Custom Slick-Mix 500®, ActiFibe®, & Feed-Fresh™. Feed to Mature horses of All Breeds, with Impaired digestive systems, and/or Worn Teeth, under Various exercise levels, receiving Various qualities of hay And/or Pasture. If feeding a 1,000 lb. horse less than 5 pounds per day, supplement with a product containing SPN Custom Slick Mix 500®. SPN Slick Mix 500 This is Digestive Therapy for your horse. Hay and grains often loose a lot of their digestibility through improper harvesting and storage. SPN Custom Slick-Mix 500 provides the essential nutrients that promote therapeutic action in your horse’s digestive system, such as: Chelated Trace Minerals; Major minerals; B-complex Vitamins; Vitamins A, D, E, & C; Suppli-Mix? ; Yeast Culture; Prebiotics; & Probiotics. These are all provided in a concentrated feeding rate of 2 ounces per horse per day, for an 750 to 1250 lb. average-weight horse. This will cause your horse to get the most out of digestion and nutrient absorption, leading your horse to its maximum potential. Most commercial feeds do not contain enough vitamins, minerals, and digestive aids all in one package as SPN Custom Slick-Mix 500 does. This can eliminate the expense and time of feeding additional top dresses - such as probiotics, hair coat products, chelated trace mineral products, hoof products, etc. SPN Equine ALIVE A nutritional supplement for metabolically-challenged horses of all ages. SPN Maximizer LITE PLUS AF Pellet (2.5#) A pelleted, nutritional, Low Starch & Low Sugar grain ration, containing SPN Custom Slick-Mix 500®, ActiFibe®, & Feed-Fresh™. Feed to Growing and Mature horses of All Breeds, under Various exercise levels, receiving Various qualities of hay and/or pasture. If feeding a 1,000 lb. horse less than 2.5 pounds per day, supplement with a product containing SPN Custom Slick Mix 500®. SPN ULTIMATE Maximizer PLUS AF Pellet (1#) A pelleted nutritional supplement containing SPN Custom Slick-Mix 500®, ActiFibe®, & Feed-Fresh™. To Be fed to horses of All Ages & Breeds, receiving Various qualities of hay or/and pasture, and under Various exercise levels. Feed at 1 lb. per head to a 1,000 lb. horse, per day, by itself, or as a supplement to either SPN Premium Grain Blend, or whole oats.